Learn all about Screen Modes in Photoshop and how to use them to maximize your work area by hiding the interface! Includes all three Screen Modes (Standard, Full Screen With Menu Bar and Full Screen) and how to switch between them, plus some handy keyboard tricks! 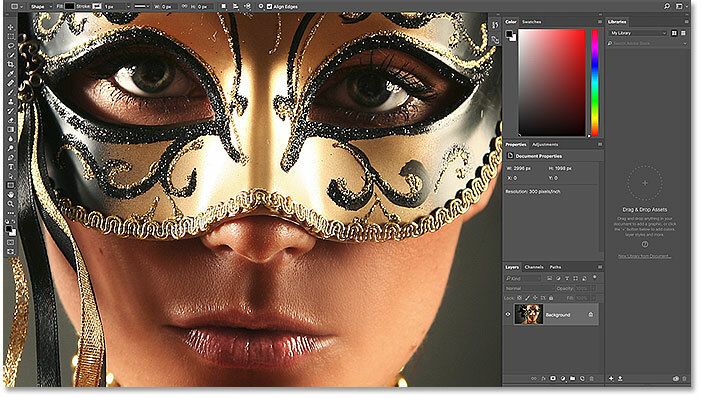 When it comes to working in Photoshop, there has always been one frustrating issue. 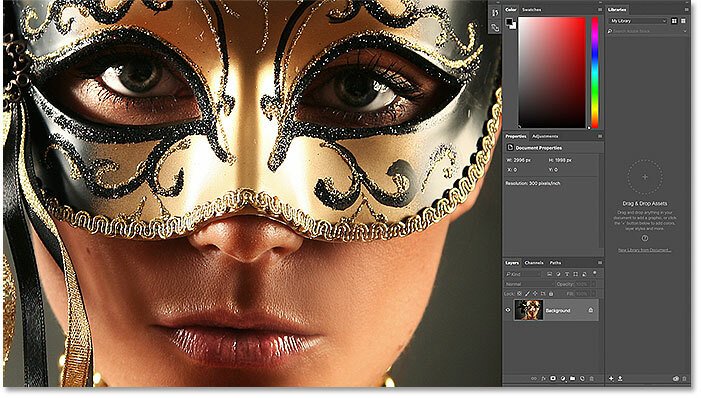 With so many panels, tools, menus and options available, Photoshop's interface can crowd and clutter up the screen. And the more room the interface takes up, the less room we have for viewing our images. As camera technology improves, our photos get bigger and bigger. 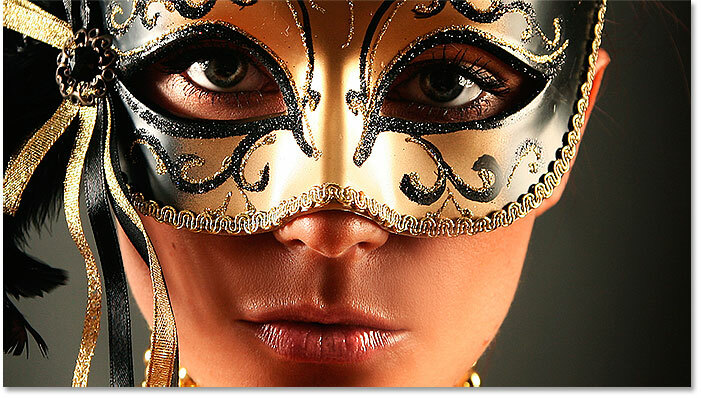 This makes finding ways to minimize the interface and maximize our work area extremely important. Of course, some lucky Photoshop users get to work with dual monitors. Dual monitors let you move your panels to one screen while you view and edit your image on the other. The rest of us, however, need to find a more practical (and less expensive) solution. Thankfully, there's an easy way to overcome this problem, and that's by taking advantage of Photoshop's Screen Modes. 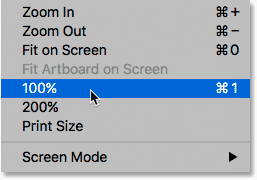 A Screen Mode controls how much of Photoshop's interface is displayed on your screen, and there are three Screen Modes to choose from. The Standard Screen Mode displays the entire interface. It's the mode Photoshop uses by default, and the one that takes up the most room. But there's also a Full Screen Mode With Menu Bar option that hides some, but not all, of the interface elements. 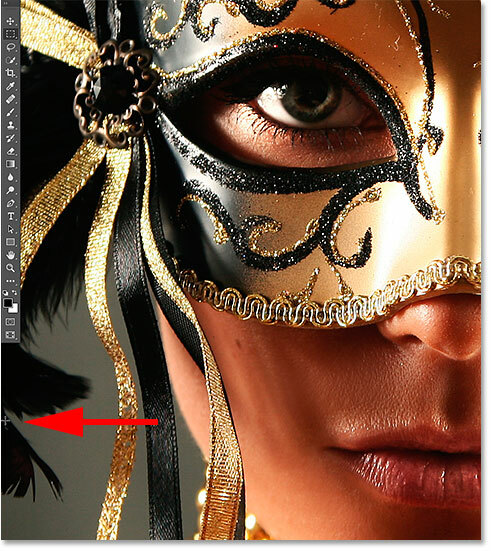 And, there's a Full Screen Mode in Photoshop which completely hides the interface, giving your image full access to the entire screen. In this tutorial, we'll look at each of Photoshop's three Screen Modes and learn how to switch between them. We'll also learn some handy keyboard tricks for getting the most out of this great feature. 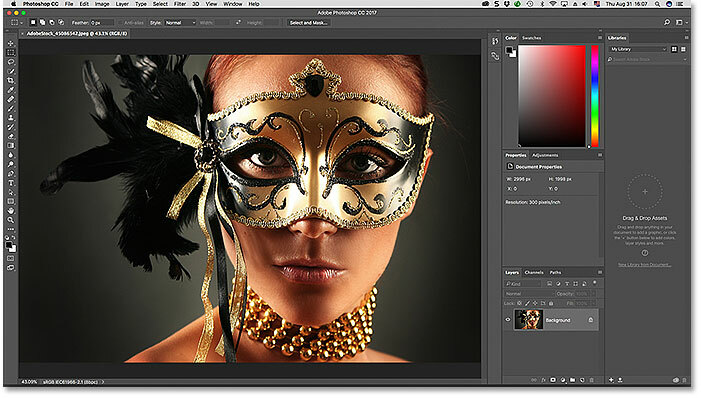 I've updated this tutorial for Photoshop CC but everything is fully compatible with Photoshop CS6. This is lesson 10 of 10 in our Learning the Photoshop Interface series. Let's get started! Viewing the Screen Modes from the View menu. Viewing the Screen Modes at the bottom of the Toolbar. 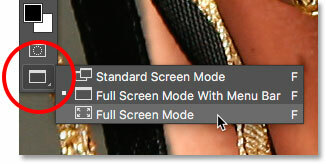 The Standard screen mode in Photoshop. 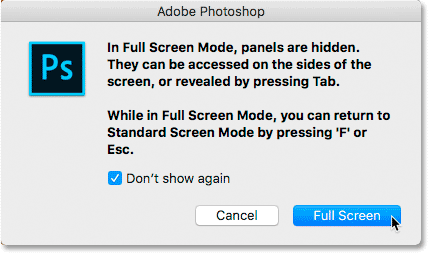 By default, Photoshop uses the Standard Screen Mode, which is the mode we're looking at here. Standard Screen Mode displays the entire Photoshop interface, including the Toolbar on the left and the panels on the right. It also includes the Menu Bar and the Options Bar along the top. The tab above the document window, scroll bars along the right and bottom, and the Status Bar in the bottom left of the document window, are all displayed as well. The Standard Screen Mode gives us quick access to everything we'd need, but it also takes up the most screen real estate. 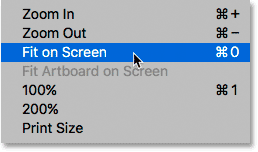 Selecting "Fit on Screen" from the View menu. Switching to the 100% View Mode. The interface clutter becomes more of a problem as we zoom in closer to the image. 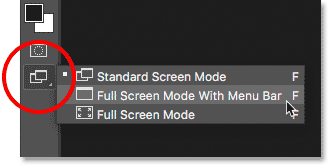 Selecting "Full Screen Mode With Menu Bar" from the Toolbar. Full Screen Mode With Menu Bar hides any interface elements related to the document window itself. Choosing "Full Screen Mode" from the Toolbar. 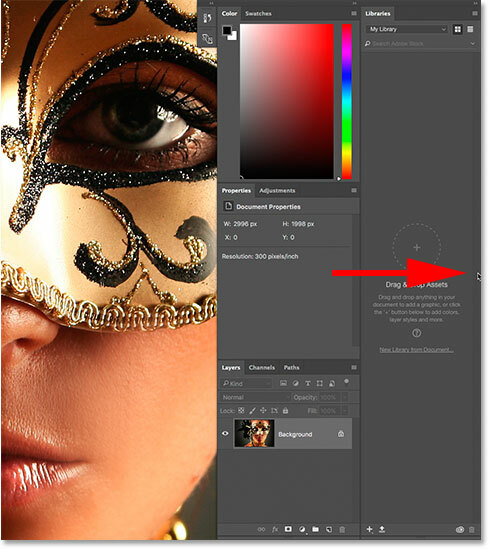 Photoshop explains how Full Screen Mode works before you switch to it. 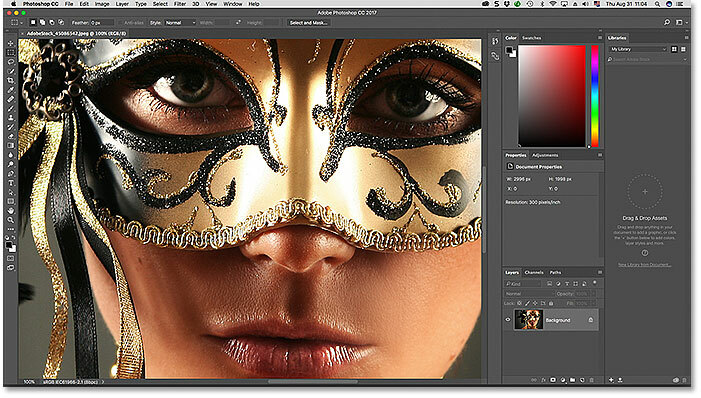 It may not look like it, but this image is still open in Photoshop. Full Screen Mode hides the interface. You may be thinking, "Gee, that's really great, but how am I supposed to work with the interface completely hidden?" Well, you could always rely on Photoshop's keyboard shortcuts if you happen to have them all memorized. But you actually don't need to be a Photoshop expert or a power user to work in Full Screen Mode. There's an easy way to bring back the interface when you need it. In Full Screen Mode, move your mouse cursor to the left edge to show the Toolbar. In Full Screen Mode, move your mouse cursor to the right edge to show the panels. 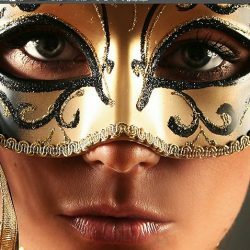 Since Photoshop's interface is completely hidden while you're in Full Screen Mode, you may be wondering how to get out of it and bring back the interface. To exit Full Screen Mode, simply press the Esc key on your keyboard. This will return you to the Standard Screen Mode. Press the Tab key to show the Toolbar, the panels and the Options Bar. Showing just the right-side panels in Full Screen Mode by pressing Shift+Tab. We've seen how to switch between Photoshop's Screen Modes from the View menu in the Menu Bar and from the Screen Mode icon in the Toolbar. But the fastest way to switch between Screen Modes is by cycling through them from the keyboard. Press the letter F on your keyboard to cycle from Standard Screen Mode to Full Screen Mode With Menu Bar. Press F again to switch to Full Screen Mode. Pressing F one more time will take you from Full Screen Mode back to the Standard Screen Mode. To cycle backwards through the screen modes, press Shift+F. 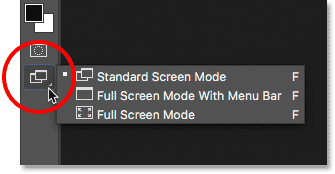 Finally, I mentioned earlier that you can exit out of Full Screen Mode by pressing the Esc key on your keyboard, This returns you to Standard Screen Mode. Pressing F while in Full Screen Mode does the same thing. Completed all the lessons? Congratulations! You're ready to move on to Chapter 4 where you'll learn everything you need to know to zoom and navigate your images like a pro in Photoshop!